Chuan Yueh Qi stands 172cm tall in her size 11 basketball shoes. It's a game that she has given her all to get into. For this 14-year-old, the youngest in a family of six, has fought hard to be the first five in her basketball team. And ever since she made it, she has been busy. During her holidays, she goes for basketball training and participates in several competitions. With training comes injuries but that has not deterred her and she continues to train five to seven times a week. She is not just active in basketball. She also does track and field events. She plays for MSSD, MSSS, Ayam A1 Junior Basketball League, Sin Chew Cup and Jasmine Cup every year. Besides participating in competitions in Malaysia, she also follows the team to other countries like Singapore, Indonesia, Australia and China. 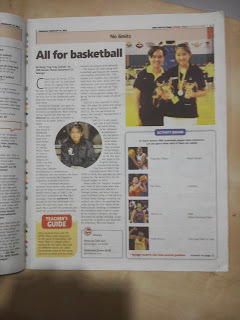 "I chose basketball because I admired those seniors who always got up on stage to receive shiny gold medals when I was at SJK(C) Yuk Chai and I wanted to be like them someday," Yueh Qi confessed. She decided to join the basketball club when she was nine years old. Her coach then spotted her potential and asked her to join his special training sessions for players with potential. The reason she kept going with basketball was because her medals and trophies motivated her. "The medals and trophies were like gold back then, but now I don't need any motivation. I just love basketball. 1 really enjoy it," said Yueh Qi. That, and her coach's support and her father's encouragement keeps her going. He has taken videos of all her games. Yueh Qi is also talented in other ways. She plays the piano and dances with her group 'Paflotion' in SMK Bandar Utama Damansara (3). She has performed for events like Teachers' Day and Form 5 Graduation Day. Yueh Qi is a very joyful girl, and all her friends feel warm being in her company. Academically, she disciplines herself to do what needs to be done, then proceeds to the things that she wishes to do. She won first place in the English Writing Competition during her time at SJK(C) Yuk Chai and scored 7A's in her UPSR in 2010. She was also the best student for the whole form for the Chinese subject in 2011. Asked what her happiest moment was, Yueh Qi said it was when she got the championship title as a Selangor player, and when she got three individual prizes in the Karnival Olimpik Muda Selangor recently. Her saddest was when she sprained her ankle during the first match of the International Challenge in Indonesia. Her ambition? Well, Yueh Qi hopes to be a fashion designer one day. She wants to design clothing create accessories or jewellery and wardrobe for television, film and theatre.